In case you didn't get around to checking Ravelry this weekend, I'm delighted to tell you that the Mystery Knitalong kits are ready for order! If you click the obnoxiously-glowing button on the sidebar here, you'll be taken to the Abstract Fiber website where you can buy them for - are you ready?- $15.00 each! I don't know about you cats, but in my world, when I can't decide between two colorways, and then it turns out that they are SO fairly priced, why, the solution to Get Both is totally obvious. 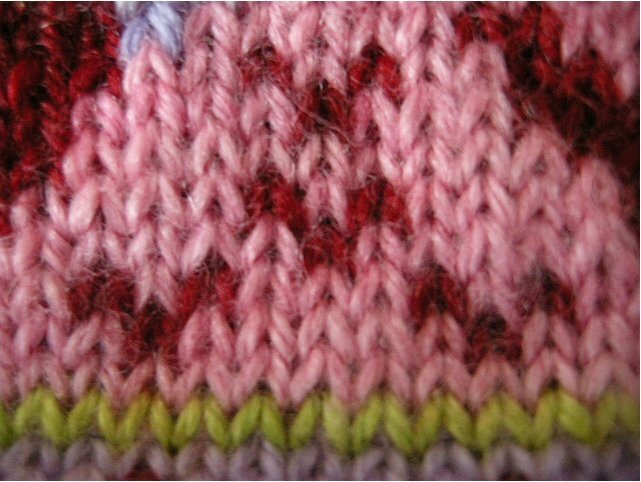 This is an extreme closeup of the sample made from Colorway 2. Notice anything unusual about this colorwork? Take your time. I'll wait. Post your guesses, and I'll tell you when somebody figures it out. Bwaaaa Haaa Haaaa! I love this KAL game a little too much. I think I may have a future as a benevolent knitting overlord. Congratulations, Emily! With a close second to Audrey, whose guess was almost correct. Yes, the stitches are upside-down. But I photographed the sample right-side up. So how can that be?? ?